Oh my gosh...this was popping up all over my Instagram feed yesterday. Barbie's new body for 2016! It looks like TIME magazine has even featured these lovely new gals in an article talking about their new diverse body styles. 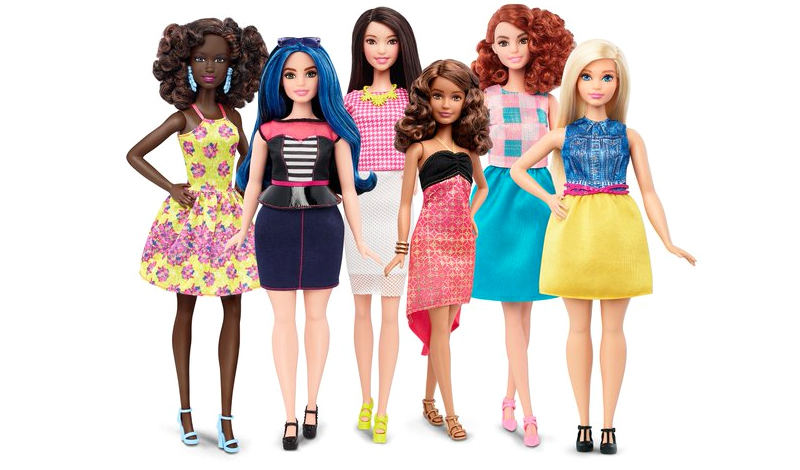 They will be coming in 3 new body sizes as well as their original shape: Tall, Curvy, and Petite. You can already order and pre-order some from the Mattel website and they cost $9.99. They also have some images of dolls coming soon. 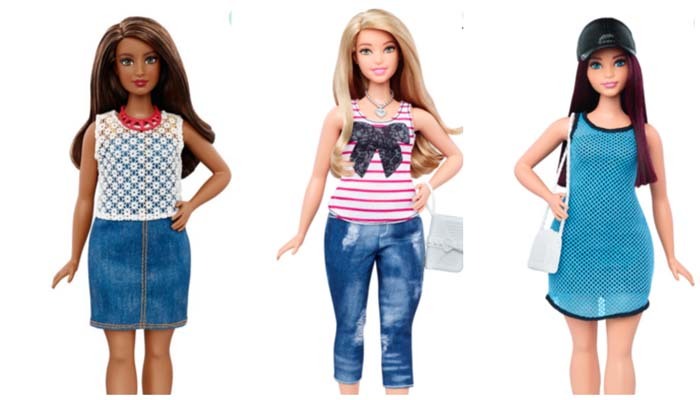 I am so excited by these new doll body types. I wish they had better articulation, but I'm not complaining by any means. I hope within time, they will design these in a similar style to the made to move Barbies. I already ordered 4 of them, shame on me!! UPDATE: Here is a nice post that shows all of them with close ups of their faces. Gosh, they are ALL gorgeous. What do you guys think? Will you be adding any in particular to your collection this year? I absolutely love that they came out with something so new and fresh this year. Fun! Which four did you order? I love seeing more options in any doll line, so by default I'm going to love any new series that has more heights and body types. It is too bad they're not better articulated, but if they take off, maybe that will end up being an option in the future. That said, I'm waiting until I see them in store to buy any (but then I'm trying to cut back on doll-buying this year in general, so that says less about the dolls than it does about me). You are so good, Jsarie...I usually always try to get the Fashionista's in stores and I'm kind of surprised at myself for preordering these as this is the first time I've ever preordered a doll. 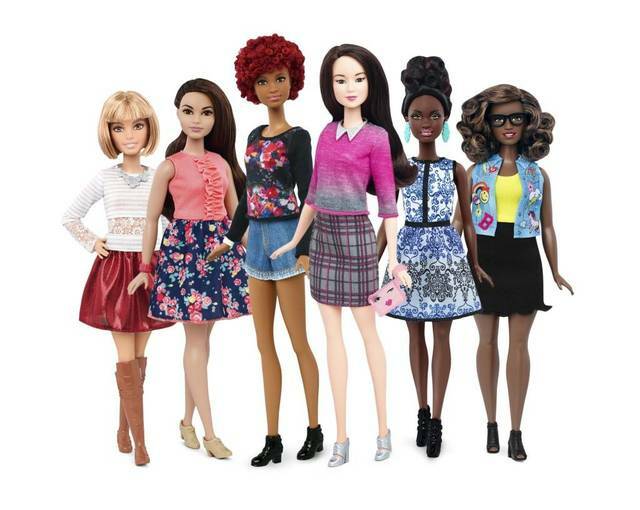 So I ended up ordering the blonde curvy one in the yellow skirt, the dark skinned one curvy one in the denim skirt, the petite dark skinned one in black and pink dress and the petite bob-style hair with bangs one in the white top and red skirt. I had a few more in the basket, but I took them out for now, lol. Trying to be good! I'll probably pick up a couple of these. I've been tempted by the regular Fashionistas, but put off by the lack of articulation. As you and jSarie said, articulation may be in the future if these sell well. Well, my mom will be happy. LOL She is 82 and she never liked Barbie due to her large chest size. She refused to buy me a Barbie when I was 5 years old, way back in the 1960's. I adored the glamour of Barbie. I loved everything about her. I'm so glad I grew up then. Barbie was part of a fantasy world, full of imagination and grownup glamour. I don't think I would have cared for a short or plump Barbie at all. Yikes. I'm short and plump now and always have wished I was tall. (was it due to Barbie's image always before me? Most likely not) An aunt gave me Stacey for my 8th birthday and I was delighted. I never did own a Barbie, but had Francie and Skipper. Well, as long as children enjoy good wholesome play, who am I to complain? But I do prefer the 1960's Barbie above all else. Hi Loretta, you should get her one of these! Lol. I have always loved Barbie as well and would spend hours playing them with my sister. Our Barbies were the Barbies of the mid-late 80s so those are the ones I like the best as well. I think we all probably like the ones that remind us of our childhood the most! To be honest, I showed photos of these to my 3 and 6 year olds and of course they still liked the original sized Barbies the most as well as the petite sizes. I guess it's nice to have options now and parents can purchase a doll that looks more like their child and hopefully promote better acceptance of self through play. You must've been thrilled to get that Stacie doll from your aunt! I agree with Loretta- 1960's Barbie is awesome. But then, 80's rapper Barbie was pretty good too. I was never really that much into dolls as a child but I did have a Sindy and a Patch and Sindy's boyfriend Paul. Then along came a Barbie in a blue swimsuit and I loved her so got her for Christmas one year. Then my brother broke her leg off....yes, I've never forgotten it! My mum glued it back on but it was never the same....I still have this particular Barbie! I also recently bought the only 'Made to Move' Barbie that our local Toys R Us had in stock. Sooooo I admit I'm not super excited about the new Barbies but I hope it's a step in the right direction for the company. I would probably be tempted if I saw them in the shops here, just for the novelty of having one of the new ones, but I doubt very much I'll see them locally. Ok, I went to look....and there are one or two...maybe three, that I would be tempted by! ;) I really like the brunette with the flowered skirt and peach sleeveless top, she's very pretty! I'm tremendously excited about this but haven't decided which to order. Yes, I'd like articulation better, but I have clones who'll never be matchable with articulated bodies, so Arms Straight Out can gain some members. Lol! Arms Straight out and Always Stretching Legs. I am just glad they are only $10! Of course, I ordered/pre-ordered some of these - Duh! Haha, you know me, I always like to get a jump on the latest and I think these are all winners. Can't wait for them to arrive! Oh my goodness! I am super excited right now! 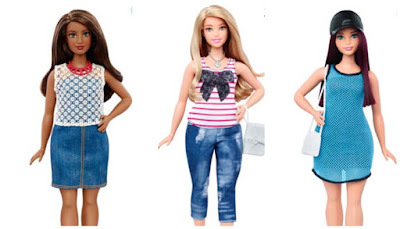 I am so happy that Mattel FINALLY created different body types! I can't wait to get one! I know, I love them! It's hard to choose which is my favorite! I saw these advertised on the tele recently Farrah. I thought it was about time Mattel realised that if they want to stay in the market, they needed to bring Barbie up to date...you can't survive on past laurels forever!! Even so, she's still not for me. Yes, it is nice that they are showing beauty in many different forms. I hope smaller companies like Lammily can remain afloat, though! This hit all our news programs too so I'm looking forward to seeing them in the shops. I'll be interested in the price as well now I know what you are paying for them. I hope they keep it the same for everyone. These dolls are really pretty, but their bodies are stiff and not worth an over-inflated price! Have you noticed any Made to Move Barbies in your area yet? Those are listed here as $14.99 as an example. They look wonderful, I really like what Mattel have been doing this year in the playline: first the wonderful made to move body, then these. I'm very tempted by the new poseable silkstone, I love Robert Best fashions so much but never bought one because I'm not a fan of the original Barbie body. Ok, I have pre-ordered two of them because I already have Fancy Flowers, so is she tall? I will be getting a AA Curvy and she already has a name, lol. I honestly think it is a great idea, there has been a push for this since I was little girl. My only concern is Barbie clothing. It's no longer going to be one size fits all. Will it be tall skinny Barbie with all the cute clothing, and short curvy Barbie with little choose from (like real life)? Will the outfits be well labelled as to which outfit fits which dolls? I will just be curious to see how this all turns out fashion wise. I look forward to reading more of your posts about these dolls in the future. I am also really excited about the Asian Barbie, our only choice was Mulan for long!